Alfred Edward Emslie (1848-1918), Painter. Artist of 2 portraits. John Campbell Hamilton-Gordon, 1st Marquess of Aberdeen and Temair (1847-1934), Statesman. Sitter in 23 portraits. Dame Ishbel Maria (née Marjoribanks), Marchioness of Aberdeen and Temair (1857-1939), Promoter and patron of social service enterprises. Sitter in 16 portraits. Andrew Cant, Piper. Sitter in 1 portrait. Henry Drummond (1851-1897), Theological writer. Sitter in 2 portraits. Constance Mary Bruce (née Carnegie), Countess of Elgin (1851-1909), Wife of 9th Earl of Elgin; daughter of 9th Earl of Southesk. Sitter in 1 portrait. Peter Esslemont (1834-1894), Merchant and Liberal politician; MP for East Aberdeenshire. Sitter in 1 portrait. Robert Farquharson (1836-1918), Surgeon, politician and landowner. Sitter in 4 portraits. Lady Mary Glyn (née Campbell) (1859-1947), Wife of Hon. Edward Carr Glyn; daughter of 8th Duke of Argyll. Sitter in 1 portrait. Edward Carr Glyn (1843-1928), Bishop of Peterborough. Sitter in 7 portraits. Maybird Hogg. Sitter in 1 portrait. Kate Harriet (née Burfield), Lady Lindsay (died 1937), Second wife of Sir Coutts Lindsay, 2nd Bt; daughter of William Burfield. Sitter in 4 portraits. Archibald Philip Primrose, 5th Earl of Rosebery (1847-1929), Prime Minister and author. Sitter in 24 portraits. Hannah Primrose (née de Rothschild), Countess of Rosebery (1851-1890), Wife of 5th Earl of Rosebery. Sitter in 1 portrait. George Washburn Smalley (1833-1916), American journalist. Sitter in 1 portrait. John Tulloch (1823-1886), Church of Scotland minister and Principal of St Andrews University. Sitter in 3 portraits. This picture shows a scene in the dining-room of the Scottish home of the Earl and Countess of Aberdeen. 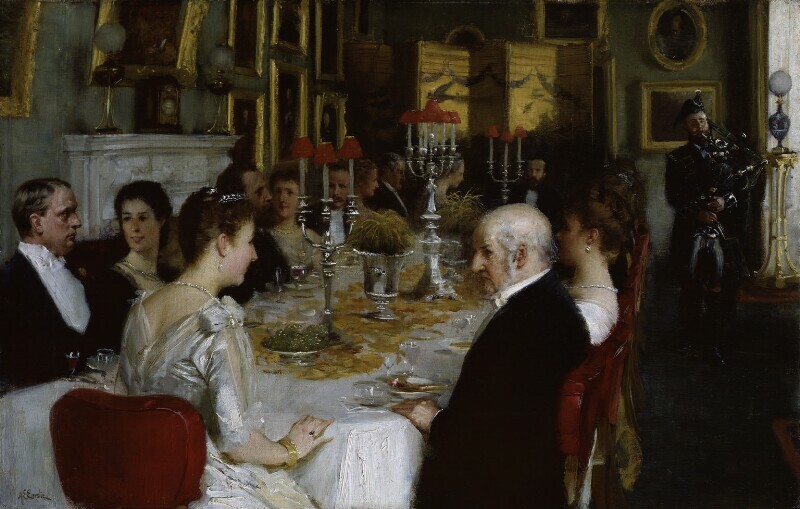 Prominent among the guests at the end of the table, and to the right of Lady Aberdeen, is the veteran statesman and then Prime Minister, William Ewart Gladstone, who was on a tour of Scotland. To the left of Lady Aberdeen is Lord Rosebery, who succeeded Gladstone as Prime Minister. Other guests include Mrs Gladstone and Lady Rosebery, Professor Henry Drummond, the Earl and Countess of Elgin, Robert Farquharson MP, and G.W. Smalley. It was a custom at Haddo for guests to be regaled with bagpipe music, the piper seen here was Andrew Cant. The picture not only records an important occasion, but is a charming view of social life in the mid-1880s.